Personalized butterfly beach towel. 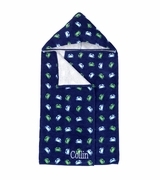 Delight a special little girl with this cute and colorful butterfly hooded beach towel. Great beach, pool, summer vacation or after bath terry towel. A daughter, granddaughter or niece will love this adorable and comfortable towel for her after swimming cover up or bathing towel. Add a embroidered name for a personalized present. Add a matching beach tote with sand toys, search item SJ-1003-90. Personalized butterfly beach towel measures 46” x 23.5”, 100% cotton and washable. Fade resistant with eco-friendly dyes.